Chicago’s 46th Annual Pride Parade kicks off at noon on Sunday and will travel for more than 4 miles through Uptown and Lakeview. The parade steps off at noon at Montrose Avenue and Broadway in Uptown, heading south until its final point at the intersection of Diversey Parkway and Sheridan Road in Lincoln Park. The Chicago Transit Authority plans to provide extra service to accommodate the thousands headed to Pride, but officials encourage commuters to take advantage of the “L” trains as traffic and street closures will cause a number of buses to be rerouted. Transit officials say the Red and Brown Lines are the best options and offer the closest and fastest service on Parade day. It’s advised to try your best to avoid Belmont station – and opt for other stops such as Wilson and Sheridan – as it is typically hit the hardest with overcrowding during the annual event. The CTA could shut down the Belmont station due to overcrowding if necessary. 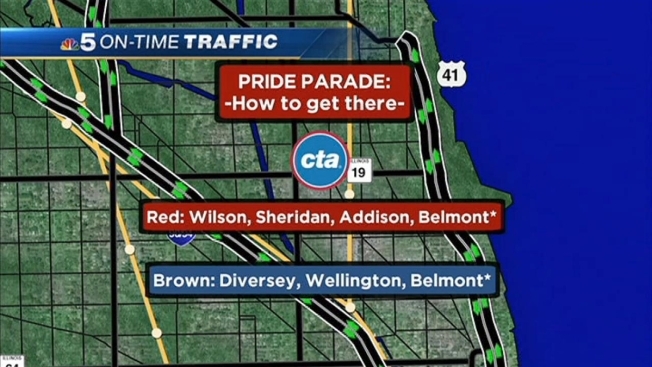 •	From the Red Line — Wilson, Sheridan, Addison or Belmont all provide access via a short walk to the parade route. •	From the Brown Line — Diversey, Wellington and Belmont are the nearest stations to the parade. •	Lakefront bus routes, including the #146 and #151, provide convenient access from the north, the Gold Coast/North Michigan Avenue and downtown, to the areas east of the parade route. Bikes will not be allowed on CTA trains the day of the parade, and strollers and carts must be folded before boarding. If you are looking to cross the street from one side of the parade to another once at the event, police officers will be available at Montrose, Irving Park, Grace, Addison, Roscoe and Wellington Streets to assist attendees. If you're looking to avoid the parade route completely, take Sheffield, Racine and Lake Shore Drive through Lakeview and Uptown. For additional information, visit transitchicago.com/prideparade.